Move over Busta, our rhymes score you a better virtual golf game with 3 free MAX balls. 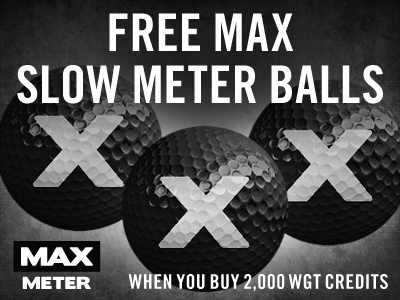 Get in on this, a special offer to get 3 free MAX virtual golf balls when you buy 2,000 or more WGT Credits through tomorrow. We know you'll like them, because these are some of our most popular virtual golf balls on WGT, giving you good overall distance and a slower WGT swing meter, making all your clubs easier to hit. 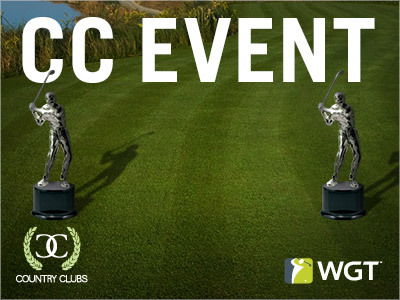 Use your WGT Credits to upgrade your virtual equipment and compete in paid games for prizes. Just buy 2,000 or more WGT Credits today through tomorrow (7/27/17-7/28/17) on WGT Golf, and get 3 MAX Slow Meter virtual golf balls (Hack+). Following The Open this weekend? While you're catching all the action at Royal Birkdale, we're giving you another reason to get excited...50% more XP! Today and tomorrow you'll get 50% bonus XP (experience points) when you play WGT, which will help you level up in the game, unlocking new equipment and features. It's sink or swim in CC Event #52! Make a new friend in CC Event #52, these Fishbowl tee markers and flags are up for grabs starting now! Compete now through Fri, 7/21 for your chance to win in-game rewards, including these friendly virtual Fishbowl tees and flags. CC Event #52 runs 7/20-7/21 with multiple 4-hour Clashes, so be sure to play as many games as you can for your club and keep your eyes on the leaderboard. 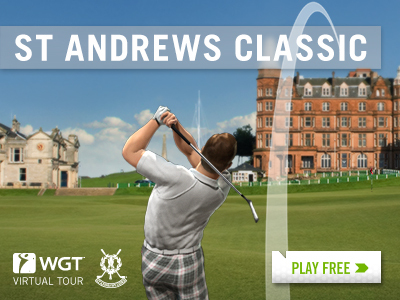 It's not every day you get the chance to go to Scotland, but we're taking you there (virtually) in the St Andrews Classic, happening now! Play one of the oldest and most beautiful courses in the world in this month's WGT Virtual Tour tournament, as part of the 2017 WGT Virtual Tour. This is the first tournament of the Jul-Sep Quarterly Season, with a total purse of 100,000 WGT Credits. Get in on the unlimited play first round (7/1-7/26) followed by a single-play second round (7/27-7/31), with the top 70 combined scores in each Pro-Champion tier splitting the total purse prize. The winning players in each Pro-Champion tier of monthly tournaments will display a "reigning champion" icon next to their player name through the following month. Put this on your mantel! Make some room for a shiny, new trophy! It's up for grabs, starting now in CC Event #51. Compete now through Fri, 7/7 for your chance to win in-game rewards, including these impressive Golf Trophy tees and flags. 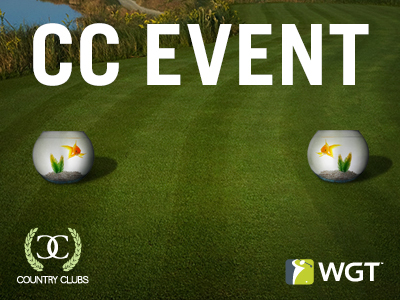 CC Event #51 runs 7/6-7/7 with multiple 4-hour Clashes, so be sure to play as many games as you can for your club and keep your eyes on the leaderboard. 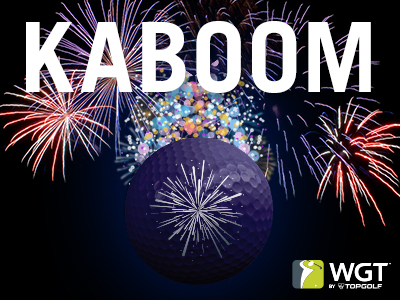 We're putting a spark in your game with a Fireworks Vapor Ball – yours free just for logging on to WGT today, 7/4. The skies are lighting up in the USA for the 4th of July, and we're lighting up your game with these virtual golf balls. Get more distance and control while watching your shots fly through the air with a sparkling vapor trail and an explosive sound. *Special offer for WGT players who log in and play WGT on 7/4/17, receive one free Fireworks Vapor virtual golf ball.